Eurogamer ran an interview yesterday with Bryan Henderson, the young man who "won" Peter Molyneux's Curiosity in May 2013. His prize was to become the "god of Godus," 22 Cans' then-in-the-works god game, and more practically, to earn a share of its sales. But after some brief initial hoopla, 22 Cans stopped replying to Henderson's emails and texts, and the prizes he was promised nearly two years ago remain undelivered. Worse, going by recent comments made by Godus designer Konrad "FuriousMoo" Naszynski, they may never be. It's a crappy situation all around, but it's now been mitigated somewhat by Not a Hero developer Roll7. "So, along with everyone and their mum—Roll7 read the Eurogamer article about Bryan Henderson. We kinda felt his pain—and asked BunnyLord what he would do in this situation," the studio wrote in a blog post. "His answer (selected from Not A Hero’s random text generator)? 'Make Bryan a God in Not A Hero and give him 1% of OlliOlli sales to date, oh and massage a wombat.'" Nigel Lowrie of Not a Hero publisher Devolver Digital told Polygon that the Curiosity/Godus mess reflects poorly on the industry as a whole, and so it reached out to Roll7 with the idea of adding him to their game instead. The studio was sympathetic and "immediately said they'd do it." Henderson won't actually be a god, nor will he be playable, at least at launch, but he will wield some pretty impressive powers, as seen in the trailer the studio made to announce his inclusion. "The world of Not A Hero is a godless place, that much is certain, but the next best thing is BunnyLord—an anthropomorphic rabbit from the future running for mayor," Lowrie said. "Roll7 is going to put Bryan in the sort of employees lounge where BunnyLord stashes his heroes/henchmen as an NPC. It's not exactly becoming a god but it's the best we could do." The offer of a one percent cut of OlliOlli sales, sadly for Henderson, was made in jest, and I'm just going to assume that a wombat massage isn't actually in the cards. 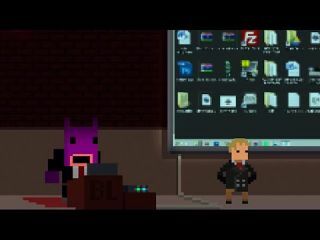 Not a Hero is a "2¼D cover-based indie shooter" that sets players off on a bloody crime-fighting mission through five city districts on behalf of the BunnyLord, who's apparently made cleaning up the city a cornerstone of his election campaign. It features "next-level shootouts," a roster of distinct not-heroes to recruit, and dynamic missions with unexpected surprises. It's got a really good soundtrack, too. Not a Hero is expected to come out sometime this year.